Lovely 4 BR 2 1/2 BA Mountain Lakefront Vacation Home with Wonderful Views! This is great! I'm so glad we came!! That's what you'll say out loud when you drive up to this fantastic mountain get-away on Lake Blue Ridge in the North Georgia Mountains. Walk thru the front door thru the slate floor entrance. Step inside the great room with vaulted pine ceilings and drop ceiling fans. 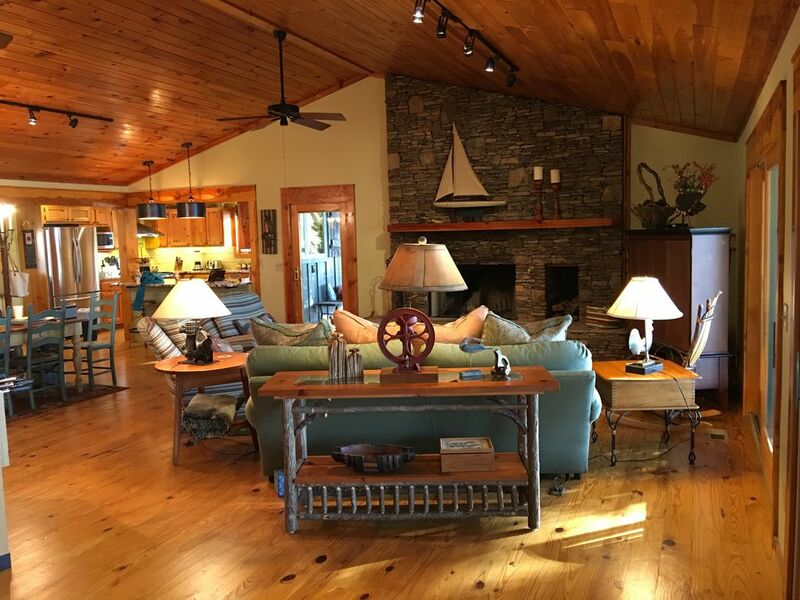 Gaze around the large gathering room with the Tennessee Fieldstone dry stacked fireplace, cozy seating including pull out Queen sleeper sofa, farm style dining table and chairs for 6 to 8, game tables, and large fully equipped kitchen with serving bar. Two wide sliding glass doors frame a breathtaking view of the lake. Step out on the generous Kentucky wrap around deck, feel the mountain breezes and drink in the expansive view of Lake Blue Ridge from this terrific vacation spot. Sip some iced tea while rocking on the porch or relaxing in the hammock. Enjoy mealtimes outside as well seating 12 or more. Returning inside, the two downstairs bedrooms (one with king bed, the other with 2 twin beds) have sliding doors accessing the expansive porch overlooking the lake. Both share a generous bathroom. Upstairs you will find the master suite with King bed and lots of floor space. The master bath boasts a generous Jacuzzi tub ample enough for two, 2 vanity sinks and private toilet behind louver doors. Just off the Master is a cozy bunk bed room with a trundle sleeping 3. From the porch, a paved walkway takes you to the water's edge to the two-story dock with tie downs for boats and sun deck on the upside. Amenities: Sleeps 10, 4BR, 2BA, master with Jacuzzi, 2 king beds, 2 twin, 2 twin bunks with trundle, queen sofa, Great Room with dry stack Tennessee fieldstone fireplace, 32 in. flat screen TV with satellite service. Foozball and mini pool table, pine floors, generous wrap around porch with 5 rocking chairs and hammock, beautiful views of the lake, large fully equipped kitchen, dishwasher, microwave, outdoor grill, multiple seating on porch, laundry room w/ full size washer/dryer, central heat/air, ceiling fans in every room, 2 story dock with tie downs for water craft. Activities: Swimming, boating and skiing, marina with boat and Personal Watercraft sales and pontoon rentals, hiking, biking. Shopping and dining in downtown Blue Ridge is a nostalgic experience. Lots of antique stores, art, and gift shops, carriage rides on weekends and fun places to grab a bite or dine. Apple houses are nearby and open for business in the fall. Area: One hour from Atlanta. We are Jan and Bill McKay. Our wonderful home on the lake has been the source of great water fun, beautiful scenery, family memory making in surroundings that are some of the most beautiful in the smoky mountains. We have always wanted a vacation home on a lake and were invited to Lake Blue Ridge years ago by some friends who owned a home here. When we stood on their porch and took in the lake view, it's beauty and mountainous smoky blue backdrop we knew that this was the lake for us. We saw this home just one time while it was under construction and made an offer the same day. That was over 20 years ago. Our children were small and spent their summers here until they were grown. Now they bring their families and friends here at every opportunity. Antique shopping, high end art, clothing stores, specialty foods, wines, wine tasting, outdoor outfitters, jewelry stores, coffee shops, fine dining, casual dining, train rides, bike rentals. Lake Blue Ridge nestled in the beautiful smoky mountains offers fishing, boating, skiing, swimming. Pontoon rentals available from Lake Blue Ridge Marina. Over 180 degrees of water view! Wrap around Kentucky style back porch with rocking chairs and hammock, sundeck with adirondack seating.